Wisconsin Governor Scott Walker's proposed budget—which would cut $300 million dollars out of the state's beloved public university system—has a non-fiscal bombshell tucked in between its insane pages. Under Walker's budget, universities would no longer have to report the number of sexual assaults that take place on a campus to the Department of Justice. Under Walker's plan, university employees who witness a sexual assault would no longer have to report it. There are no policy recommendations in Walker's budget how or what would replace these reporting mechanisms. The Governor simply instructs that they should be deleted. For those of you who are unfamiliar with the bewildering force that is Scott Walker, know this: he is a small-time guy who is having a big-time moment by playing the conservative werewolf, a role Chris Christie and Jeb Bush are so far unwilling to play in their presidential bids. 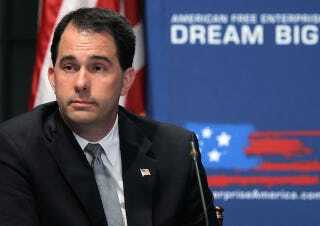 As the election cycle drags on you will be able to tick off the boxes on Scott Walker's CONSERVATIVE STRONG MAN card. Count this as the first of many boxes. Below is the text from the budget proposal to 'delete' the requirements.